Researchers are singing praises to coconut water’s many health benefits. Coconut water is the ultimate thirst quencher that offers a tasty alternative to water. People all over the world drink it for its unique taste and its ability to refresh the body almost instantly. The water is obtained by opening a tender, green, healthy, and undamaged coconut. Each coconut may contain about 200 to 1000 ml of water depending on its type and size. The refreshing coconut water is a storehouse of natural healthy sugars, vitamins, minerals, electrolytes, enzymes, amino acids, and phyto-hormones that give the drinker a wide range of health benefits. In many tropical regions, coconut water is often given to patients with diarrhea to help replace fluid loss from the body. The ingredients in coconut water are more effective at hydrating the human body, compared to the ingredients in sports drinks and energy drinks. In fact, the composition of tender coconut water is quite similar to what the World Health Organization (WHO) recommends for its ORS (Oral Rehydration Solution). In addition to the salts and sugars in the ORS, coconut water has amino acids, enzymes, minerals, and fatty acids. Each glass of coconut water contains 290 mg of potassium and only five grams of natural sugar. Which means each glass contains twice the potassium content of most sports drinks and about a quarter the sugar content. Add the fact that there is a lot less sodium, and you’ll know why doctors all over the world consider coconut water better than sports drinks. Coconut water finds itself high on the list of home remedies for high blood pressure. One of the causes for high blood pressure is an imbalance of electrolytes in the blood. Because coconut water contains an adequate supply of minerals and salts, it can help counter this imbalance. Modern researchers say the potassium content in coconut water plays a huge role in lowering blood pressure. Both potassium chloride (seen in supplements) and potassium citrate (seen in foods) can help lower blood pressure. Potassium helps balance out the level of sodium in your blood and keeps your body functioning properly. In one study, reported in The West Indian Medical Journal, researchers noted that consumption of coconut water resulted in a reduction of systolic pressure in 71 percent of the participants and a reduction in diastolic pressure by 29 percent. As promising as this is, more studies need to be done to give a proper answer to the question of how long does it take for coconut water to reduce blood pressure? The American Heart Association urges patients with high blood pressure to eat according to DASH (Dietary Approaches to Stop Hypertension). Now all the vegetables in the DASH diet are rich in potassium. As the potassium in coconut water will function much the same as the potassium in DASH vegetables, it’s a great idea to drink coconut water for controlling blood pressure. Because of its soothing effects on the stomach and intestinal lining, some are calling coconut water “nature’s gastroenterologist.” If you, or anybody you know, is suffering from indigestion or acid reflux, coconut water’s rich fiber content and natural enzymes can help you get back on your feet. When you have a GERD (gastro-esophageal reflux disease) attack, sipping coconut water every hour helps a lot. This can be continued all through the day as it does not have any side effects. Coconut water also improves digestion and metabolism via bioactive enzymes. Its electrolytic effect also helps the absorption of food and efficacy of drugs. It is also known to help soothe intestinal pain and spasms. There is also a lot of talk about coconut water being able to cure more serious intestinal illnesses such as Crohn’s disease. Add to the list, it helps relieve constipation and improve intestinal function. While these are the three main health benefits, there are other uses and benefits of coconut water, too. 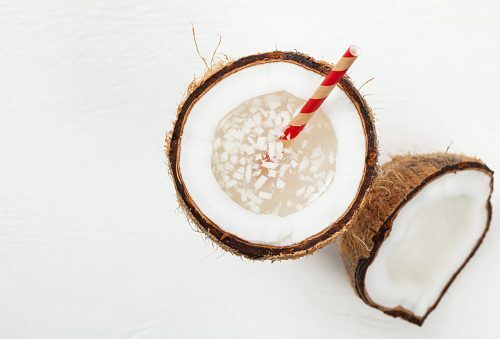 Brain health: Thanks to its high electrolyte content, coconut water acts as a fuel for the brain and muscles. The nerve signal is a coordinated movement of sodium and potassium ions across the nerve cell membrane. A deficiency of potassium can cause improper functioning of the nervous system, so drinking coconut water can ensure proper nutrition to the nerve cell membrane. Kidney health: A natural diuretic, coconut water increases the flow of urine, helping prevent urinary tract infections and cooling the body. The high potassium content in coconut water may also prevent or at least slow down renal disease. By increasing potassium intake, you can help lower urinary calcium excretion. This can play an important role in preventing osteoporosis (bone loss). Diabetes management: Low serum potassium can cause glucose intolerance. By increasing potassium intake – through drinking coconut water – we can prevent the development of diabetes. Heart health: Studies show that a reduction in serum potassium increases the risk of lethal ventricular arrhythmias in patients with ischemic heart disease, heart failure, and left ventricular hypertrophy. This is one of the reasons many cardiologists in tropical countries recommend drinking coconut water to their heart patients. Immune health: Coconut water contains high levels of lauric acid, which is what is used by the body to make monolaurin – a fatty acid that helps fight disease. Lauric acid also has antifungal, antibacterial, and antiviral properties, which help you protect your body against infection. Benefits of this all-natural, uncommonly nutritious beverage are great. Coconut water is an excellent way to quench your thirst, boost hydration, and increase your intake of important vitamins, minerals, and phytonutrients. While most people have no reason to fear coconut water, do keep in mind that coconut is actually a tree nut. So people who are allergic to tree nuts might develop allergic reactions after drinking coconut water. And one last thing: Coconut water is to be consumed fresh from young coconuts. Any nuts younger than five months of age tend to be bitter in taste and devoid of nutrients. In contrast, mature coconuts contain less water. Coconut milk obtained from coconut meat should not be confused with coconut water. Coconut water is best when consumed right after cutting the nut open. If it is left open for some time, coconut water loses all its beneficial nutrients and can no longer be considered a healthy drink. Drinking bottled or canned coconut water is the most convenient way to get these nutrients, but if you’re going on a holiday to sunny climes, get your coconut water straight from the tender fruit. It’s heavenly. And if you’re with a loved one, try two straws – it makes for a romantic picture (good for the heart).